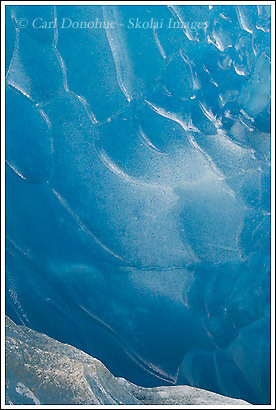 Here’s another from the Tana Glacier, only this time from in a little ice cave I spotted. Well, I didn’t venture too far into it, it was more of a bridge than a cave, but I went inside enough to get dripped on. Pretty cool. The blue inside these glaciers is so vivid – it’s exciting to see it, weird as that sounds, that a mere color might excite someone. I shot this image, as with most of these compositions, with and without a polarizer, to see the effect, and to get a couple of different takes. I tended to like the images with less polarization, where the glare shows a bit more. A polarizer filter, much like a pair of polarizing sunglasses, can almost completely get rid of the glare in a place like this. But I found the images didn’t grab me as directly. I liked the edges the glare created. The Tana Glacier, Wrangell St. Elias National Park, Alaska. This entry was posted in Abstract Photos, Alaska, Landscapes, Wrangell - St. Elias National Park on September 20, 2008 by Carl D.
So if I come to AK next year would you take me to these fabulous locations :)? The only thing that scares me about these ice caves is the possibility of the ice caving in…lol, call me paranoid. I like the cool shot :). You nailed the exposure and have managed to bring out the detail inside the cave. Excellent shot! That is wicked! The only cave I’ve ever been in was Ruby Falls. Quite fun, though. And very colorful.